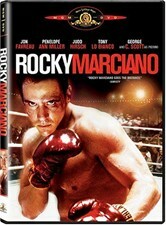 In this knockout biography, Jon Favreau plays famed heavyweight boxing champion Rocky Marciano. The film follows Rocky's formative years in blue-collar Brockton, Mass., and his relationship with his shoemaker father, as well as his most memorable bouts, including one with idol Joe Louis. George C. Scott, Penelope Ann Miller, Judd Hirsch, and Tony Lo Bianco also star. 100 min. Standard; Soundtrack: English Dolby Digital stereo Surround, Spanish Dolby Digital stereo Surround; Subtitles: English, Spanish, French. Narrated by Robert Loggia, this insightful documentary provides a definitive overview of the life and career of Rocky Marciano. Along with an examination of his unprecedented 49-0 victories, the program sheds new light onto the pugilistic skills of the "Brockton Blockbuster" through interviews with family, friends and associates--including author Gay Talese and trainer Angelo Dundee. 60 min. Standard; Soundtrack: English Dolby Digital stereo.